Oh my, THESE are so good. I made 2 dozen whole wheat tortillas today. 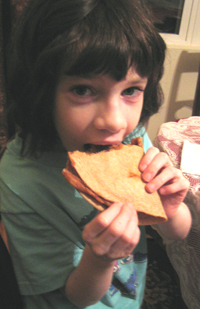 For my Double Decker Tacos, I baked some of the fresh tortillas into crunchy taco shells. 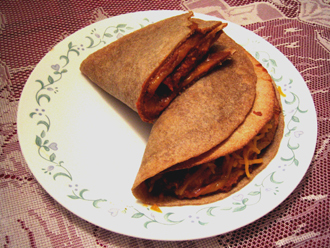 Outer shell (soft tortilla) was spread with refried beans, cheese and the inner taco shell (baked crunchy shell) was filled with vegetarian meat substitute (you could use beef, turkey, beans, tofu – whatever) mixed with diced tomatoes, salsa, chili powder, cumin, ketchup, cheese and sour cream.